If you've been following along on my Instagram account the past 21 days, or if you follow Press On & Run (link above) you've seen the daily posts on what I've been eating & how the days have been going. 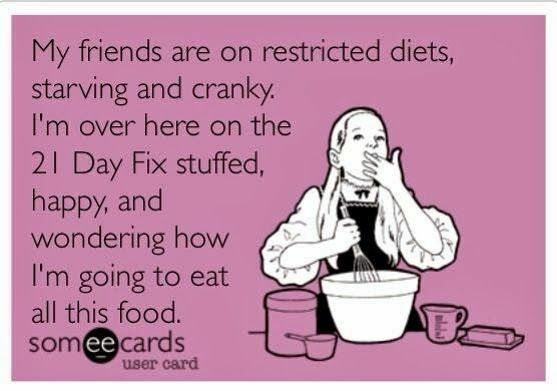 All of it showing my turn in the 21 Day Fix. That plan that deals with colored containers & an exercise program & how you can only eat so much of each color per day. It's all the rage right now apparently because just look at #21dayfix on any social media & you can sit for DAYS looking at all the pictures of everyone doing it right along with you. I actually ordered my package in May & decided to wait because 1.) I wanted to read up on it & go into it prepared. & 2.) I was off work the last week of May & I wasn't about watching food & calories on a freedom week. & then my package came... & I opened it up & saw what the containers looked like. Apparently I'm not alone. They are alarmingly small. But deceptive. I'll talk more about that in a minute. As I got closer to the date, I was making out menu plans & went to Sam's Club to stock up on fruits & veggies. The biggest change for me was lunch. I'm someone who usually eats at Subway at least 4 days out of the 5 & Subway is a luxury to use a lot of your Yellow container or as I found out, can get a salad, but that left me hungry. So regardless, I needed to bring food to work for lunch & snacks. I would sit on the couch with my laptop & a notebook & I was trying to figure out meals & how it would all come together. I may have over thought at some points on this... especially when I woke up in the middle of the night with the idea of red containers floating in my brain. It was mainly getting in it & trying it out. I quickly found that 2 eggs counts as 1 red (protein) & that is some filling stuff. It's become my staple for breakfast every day. I eat them at 6:15am & I'm usually ready for a snack at 10-10:30pm. I used to be hungry for a snack around 9 - & then I'd usually eat Goldfish crackers. Now, its apples & PB, or grapes, or cottage cheese. & I'm good with that. It holds me over to lunch. They want you to eat around every 2-3 hours during a day, so I basically get a breakfast, a morning snack, lunch, afternoon snack, dinner & then some nights I have a evening snack. I was shocked at how much food I actually get. & truth be told, I have yet to have a day where I have eaten all my containers I'm allowed to have for the day. The greens are my worst - the veggies... of course. I struggle with my green container the most. I'm just not that much of a fan of veggies I guess - but I think what it comes down too - there's just not a lot of veggies. Honestly. You can only have so many carrots or broccoli... or salad. But I see where I need more work. 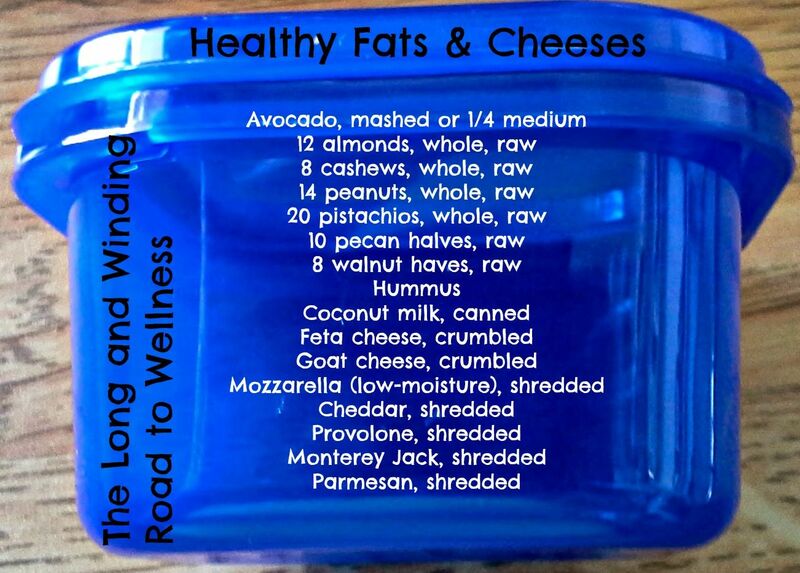 The Blue container is my favorite... healthy fats.... avocados, cheese or hummus. Yes please. But like I mentioned, when I saw how small the container was, I panicked. Imagine my relief when I when I went to fill it up with hummus & it ended up being like 3 huge tablespoons. Such relief to see! Once a day, eating my blue cup of food, I am a happy girl. Red is another struggle for me but I've always known I have a hard time getting in enough protein. Protein shakes after work has become one of my favorite things. It fuels me up for my workouts too. The program comes with 2 DVD's that have workouts for every day. They are each 30 minutes long & each day is supposed to work each part of the body, but in my opinion, each workout works the WHOLE body. Now, let me preface here & say, I am used to working out. I work out 5-7 days a week ANYWAYS so I thought, how hard can this be. DEAR SWEET LOVING BABY JESUS!!! HELP ME!!!!! They are tough workouts! The first week, I literally cried from laughing so hard in my misery. & I couldn't hardly walk up the steps at work. I wish I was joking. It was that tough. BUT... I will say, its amazing to me how fast your body adjusts because you see a difference even doing it the next week for the 2nd time. Progress is amazing. In the end, I am impressed with the program. & I did get some results. & now, its weird because my brain is just sort of working in this new world. We eat out & I am figuring up how many containers it all is. I've even given Ricky half of my sweet potato or scooped off too much rice on my plate because I'm getting use to portions now. So anyone else try this yet? Thinking about it? I know the internet is FULL of info about the 21 Day Fix but most of them are usually written by Beachbody coaches... a whole other topic... but for me, I've got nothing to gain from this post - just wanted to share my experience with it... but I'd be happy to answer any questions truthfully if you have any. I'm determined to be in the best health & best shape I can be in... its a fight... but its worth it. Congrats on the good results so far ... and hoping to see those big numbers in another 3 weeks. i have heard of it but wanted to see some real results, and not just from someone selling it, you know? so i appreciate your review and congrats to you!!! Portion control is hard for me too! I might have to look into this. Sounds like you had great success with it! Doesn't this also go with the shakeology shakes? I looked into doing it previously but after trying the shakes realized I needed to find something else. Those portion controls usually are the hardest but you're doing great if you're realizing without the containers, keep up the good work!! Interesting, thanks for explaining! I've seen lots of stuff about this fix but didn't really understand what it entailed. so i read this post last week sometime and thought I had commented but it was still on my Bloglovin feed so I guess I didn't. Even though you didn't see as big of a return on the scale as you'd hoped, I think 10 inches is fantastic! I know the changes you are making will benefit you far more than a couple pounds for years to come!